Anna Massey learns the creepmaster's secrets. Peeping Tom, 1960. 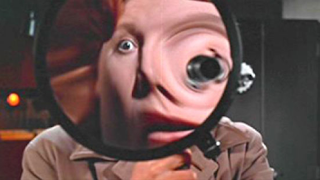 1) Peeping Tom, 1960: There's a reason slumber-party favorite "Bloody Mary" persisted from my mother's generation to mine: Mirrors can be creepy! And films don't hesitate to take advantage: Candyman, Poltergeist, Black Swan, The Shining, and, of course, Mirrors, all feature mirrors as either a central plot point or motif. Even some of the best moments in my beloved Twin Peaks involve mirrors. But Peeping Tom takes the cake. Michael Powell's story of a young man/serial killer whose life is ruled by surveillance features a terrifying mirrored climax. Overall it's more of a comment on the role of documentation (we learn along the way that our villain is the way he is because his father constantly filmed him growing up—now seen as not intrusive, but expected), but mirrors wind up being an essential part of his hijinx. 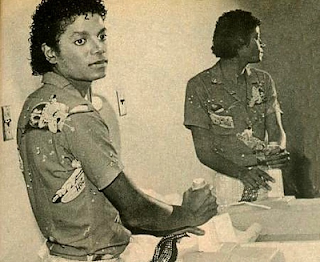 3) "Man in the Mirror," Michael Jackson. Bear with me here, people! Cheesy, simplistic, overwrought, sure. But it's a perfect example of the ways in which the mirror deludes us. Were the singer any other pop star, it wouldn't haunt me so. With this singer with this history, though, the lyrics become poignant, painful. The man in the mirror is supposed to reflect back a potentially better self. But it's impossible for me not to think of the allegations of pedophilia against Jackson when hearing: "I see the kids in the street / With not enough to eat / Who am I, to be blind / Pretending not to see their needs." I have no doubt in my mind that whatever Michael Jackson did to children, he did not because he was a monster but because he was so damaged as to see himself a child as well—a rich, famous, otherworldly child who on some level probably believed the bizarre Neverland he set up was, indeed, fulfilling children's needs. The mirror didn't reflect back what the rest of us saw. And it was a tragedy for everyone. 4) Mirror Mirror Off the Wall: So how awesome was it when, two days into my mirror fast, I hear from Kjerstin Gruys, a sociology Ph.D. candidate at UCLA who is abstaining from mirrors for a year? She taught herself to apply makeup without a mirror; she's not looking at photos of herself—oh, and she's getting married in October. With her thoughtful mix of personal stories, sociology background, and wholeheartedly lady-positive approach (she's also a volunteer with the amazing About-Face), Mirror Mirror Off the Wall is an engaging, amusing, sincere blog, and I look forward to continuing to read about Kjerstin's insights. 6) "Funny Is Never Forever," Richard Melo: This short story is actually one of many connected super-short stories collected at fiction-social-networking site Red Lemonade; it's about an American nursing hospital in Haiti in the 1950s. It's the second story here that particularly interests me, the intimacy of having both a personal double and a mirror double; Melo's work consistently has a tender, gentle pulse (as evidenced by his novel Jokerman 8), and this collection is no different. 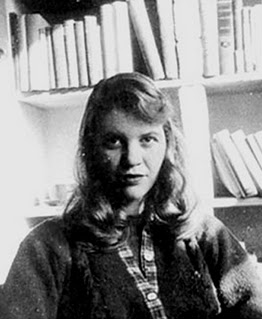 7) "Mirror," Sylvia Plath: Says the mirror-narrator of Plath's poem, "In me she has drowned a young girl, and in me an old woman / Rises toward her day after day, like a terrible fish." The divided self shows up repeatedly in her work; even her thesis at Smith was titled "The Magic Mirror: A Study of the Double in Two of Dostoevsky's Novels." One of her last poems, "Contusion," even ends with the double's retreat after its initial rush: "The heart shuts / The sea slides back / The mirrors are sheeted." 8) Mirror Mirror: a History of the Human Love Affair With Reflection, by Mark Pendergrast: From the Venetian mirror-makers who enjoyed cultural prestige but who were kept prisoner on Murano island, to divination using mirrors, to the 1928 sample room at Macy's that featured entirely mirrored surfaces and led to a near-frenzy, this complete history of mirrors is interesting on a technical level, though I longed to know more about who was doing all that looking during the eras he describes at length. 9) "Snow White", the Brothers Grimm, translated by D.L. Ashliman: From the poisoned comb to the too-tight corset that the evil queen uses in her homicide attempts, this story is an incredible comment on the trappings of femininity. (I'd forgotten that the original ending has the queen dancing herself to death in heated iron shoes. Yowza!) But it's the mirror that began it all: The queen was fine and dandy being superlatively gorgeous until the mirror told her that someone out there (a seven-year-old!) could do her a thousand times better. It makes a fine ending for Anne Sexton's retelling as well: "Meanwhile Snow White held court / rolling her china-blue doll eyes open and shut / and sometimes referring to her mirror / as women do." 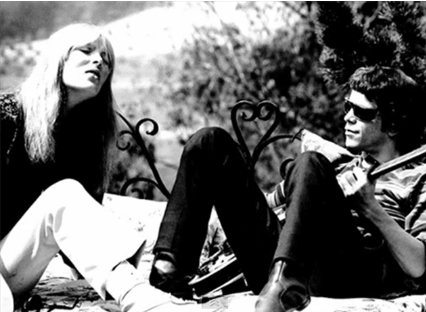 Nico and Lou Reed are cool. Cool! So cool. 10) "I'll Be Your Mirror," The Velvet Underground: Early in my mirror fast I had dinner with my friend Lindsay, who covers the beauty beat at The Daily News, bringing things like makeup ad falsities to New Yorkers. She told me that she'd be my mirror, "as Nico sang," and because both Lindsay and The Velvet Underground are extraordinarily cool and I want to be extraordinarily cool too, I pretended that I knew the reference. Luckily, I didn't have to pretend for long, because on the morning of my birthday I awoke to "I'll Be Your Mirror" waiting for me in my inbox from another friend. Aww, you guys! "When you think the night has seen your mind / That inside you're twisted and unkind / Let me stand to show that you are blind / ... 'Cause I see you." Short, plaintive, and, of course, extraordinarily cool. Kjerstin, how awesome! It is indeed a romantic song (the second "friend" I mentioned was actually my boyfriend...)--and I'm loving the cover! How fitting. I've added the blog you recommended to my reader. I've just read Pendergast's book Mirror, Mirror. Fascinating--especially all the astronomy. Kjerstin and Autumn are my anti-mirror idols! Amazing work from you both! I'm scaling back my dependence on my stupid reflection. Especially in the car. It doesn't matter how recently I've plucked my eyebrows - I still feel like a bushy-browed fool when I look in my car mirror. Hah! Also, you may be happy to know I didn't wash my hair yesterday OR today and it looks JUST fine. Thank you for showing us all the light! Excellent song reference too. Lindsay, you know what's funny is that when I did finally glance in the mirror (still haven't had the good, long look you'd expect, somehow) I noticed that my eyebrows really WERE out of control. Ha! I say give it a try for a day, no mirrors, and just see what happens. What could it hurt, right? Kjsterin, good luck with the mom visit! During week 2 I went to the eyebrow threader and was all, "go at it" and didn't look at the results (though I pretended I did so she wouldn't feel like I didn't care about it) and it was weird--made it this clinical sort of interaction, like getting my blood pressure checked or something. Words are way more than a means of communication; they shape your beliefs, behaviors, feelings and ultimately your actions. Written or spoken, words continuously propel you through life. They make you or break Women Air Max Thea Print you. They lift you up, drag you down, wound you, and heal you. Words paint the landscape of your world. In the beginning Women Air Max 2015 LG was the word, and the word was made flesh. Yeah, youve got that kind of power. Nike Zoom Hyperflight The words you speak have a profound Women Air Max Motton 2014 effect on the people they touch. Remember a time when you used words in a way that discouraged someone. What happened when your words encouraged someone? Words create a ripple effect that can reverberate through someones life and change them. What ripple will you create with your words? Take a moment to Nike Air Max 2015 Mens reflect on your words again, but this time notice how your words change in delivery and in effect with your inflection, tone, rhythm and emotion. Men Air Max 2015 LG What you feel is conveyed in your words as much, or even more, than the words themselves. 80 percent of our life is emotion, and only 20 percent is intellect, says Dr. Frank Luntz in a PBS interview. I am much more interested in how you feel than how you think. I can change how you think, but how you feel is something deeper and stronger, and its something thats inside you. Words have tremendous power, both to describe but also, to prescribe. I invite you to explore the energy of the 10 words below, as they capture the essence of Gratitude. Linger over each word, as if you were an archaeologist dusting off an ancient relic, newly unearthed. Experience each word with curiosity and wonder. Notice any memories, or thoughts, that come to mind. Say the Nike Air Max 1 Mens word out loud and play with your tone, Nike Free Run+ 3 volume and inflection. Experiment with the words as if they were ingredients in a soup. Play with the words, combining them, creating context and meaning. Adela Rubio is a Joint Venture Strategist who helps coaches and creatives share their message and Sneaker Online build their tribe using engaging listbuilding strategies. She is an expert at creating experiential online virtual events that position you to free your Unique Essence, share your Authentic Message and power boost your reach with Joint Ventures. Let Adela teach you how powerful partnerships can be. Cumulate Swift Lucre By Trading With Forex Overdrive, The C. H. Th . Offer a little extra help: Offering Nike Zoom Hyperev help does not have to be a huge exertion. If someone drops something, pick it up. Let them know that they are worthy of help and a little extra attentionno matter how small the Nike Air Yeezy action, it is the intention behind it that counts. Make thank you your favorite phrase: Do you Nike Football Boots say Air Jordan XII 12 thank you enough? Think about Dunk SB Low Cut it. Making thank you a hallmark of your social interactions will make people appreciate you and want to spend time with you because they know they are appreciated. Praise someone: Give an extra compliment to someone, a coworker or a friend. Let Nike Free Run 5.0 Kids Children Shoes them know that you value what they do, what they say, and above Nike Shox Turbo 13 all who they are. Listen: You can show that you appreciate someone by really listening to what they have to say. Sometimes people just want to know that they are seen and heard, and if you authentically listen to what they have to say, you will boost their self esteem and self worth ten fold. Replace criticism with gratitude: Did your spouse leave the towel on the bathroom floor again? Did your coworker start chewing his food too loudly during a meeting? Instead of criticizing the habits that annoy you, try to focus on showing gratitude Designer Shoes to the people in your life, even when they annoy you the most. You will feel better and more centered if you dwell on the positive instead of the negative. Gratitude is a major factor in keeping us connected to those around us. As human beings, we are relational and the main purpose in our lives is to keep ourselves connected with those around us, as this facilitates our ability to receive love, safety, and comfort. Showing gratitude is a way of making the people around us feel that they are worthy of love, safety, and comfort. Gratitude is a humble way of nurturing the seeds of human relationships that lead us all to feel better about ourselves and our place in the world. Want to lead the field like Fred Couples at the 2010 Masters tournament? Consider picking up a pair of the stylish new Fred Couples golf shoes he debuted Thursday at the Masters, the Ecco Jordan Spizike Golf street premiere shoes (video below). ECCO is a manufacturer of high end golf shoes. Some have said the Fred Couples shoes he doneed, which are black and orange, looked like something you might see a pro skateboarder Nike Nike Air Max 2011 Leather Mens Air Max 90 EM Womens in. Couples has dealt with back problems throughout his career, and the new Nike Air Max 2011 Reviewed Womens shoes may be just the added support and comfort he needs to excel on the golf course. Couples who is age 50 currently leads the Masters tournament after the first round. He shot a score of 66, and has several tied for second place that are hot on his trail. Tiger Woods, who is still aligned with Nike, is tied for seventh place with a score of 68. Speaking of Nike, if you remember the old Spike Lee Michael Jordan commercials, we soon may be Air?Max saying gotta be the shoes if Couples pulls off the victory wearing the new ECCO Golf street premieres.